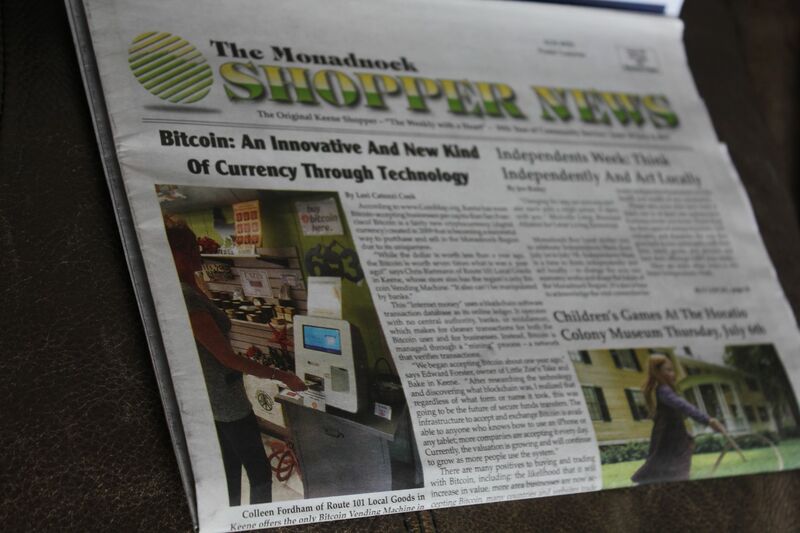 Bitcoin Hits Front Page of Monadnock Shopper News, Delivered to 40,000 Homes in Cheshire County! Bitcoin Front Page Article Delivered to 40,000 Homes! Since 1958 the Monadnock Shopper News has been connecting the people of this region with local businesses on a weekly basis. They deliver to over 40,000 households via postal mail – basically every home in Cheshire county. How exciting to see a feature article about local bitcoin-accepting businesses here in the Keene area as their headline, front cover story in this week’s issue! The Shopper News’ reporter went to visit with Chris Rietmann, one of the proprietors of Route 101 Local Goods, a unique store featuring locall-sourced products that’s also where bitcoin (and other cryptocurrencies) can be spent, plus bitcoin can be purchased from the region’s only Bitcoin Vending Machine, and you can even buy delicious Vietnamese food from the “Bon Vivant Gourmet Street Food” truck parked just outside at 661 Marlboro Road in Keene. Ed Forster of Little Zoe’s Take and Bake Pizza and Ken Urbanski of Kirby’s Q in Alstead were also interviewed in the front-page piece. The bitcoin-accepting business owners commented on their interest in Bitcoin while Rietmann explained important aspects of what makes Bitcoin special. Rietmann is frequently seen introducing new users to it in his shop, since his store has the Bitcoin Vending Machine which makes buying it a snap. The article even lists a bunch of local businesses in the area (ranging from food to sports to car repair) that accept bitcoin! Keene, as you may already know, is the undisputed city with the most bitcoin-accepting businesses per capita, per coinmap.org. You can read both pages of the Shopper’s feature article on bitcoin even if you don’t live in the area, by downloading this PDF. Awesome! What’s next to come out of Keene? Certainly the times are a changing. Bitcoin is Congress derived, just another socialist instrument to keep Americans from having its own money and allowing the banking cabal (Fed Reserve) in the city of London to apply economic slavery, though D.C. and the Free Masons whom already assist the Foreign Estate Proceeding in D.C. with Pope whom then files on you all as abandoned estate property place in 1929 Lateran Treaty of Pope, but I find it hard to believe that you people in this authored narrative right HERE will bite on crap like this. No wonder the communist ancient pledges of 1933 that was placed by communist President Roosevelt worked for almost 100 years… no wonder your title deeds to your property if you have property, have you listed as a renter in an habendum clause instead of as an owner, no wonder you get switched from joint house resolution 192 that pays off property for Americans in the treasury (all needed is signature note) and instead you get transferred into mortgages that also switch you into copyright for stock market translation as in Fannie Mae and others unlawfully. Then I read this like everyone is happy, we got more imaginary money. Here is the Honest truth about American money….. 1st the Fed Reserves are notes for originally only for upper government, but refugees and Citizenry where allowed to use to keep Human Rights violations away. YOU have none, NO Money, and I say again on my last, You have none, no money ! The closest there is will be under The United States of America 1781 a restored Perpetual Union. If you sign up with their Continental Public Bank and GPEX, and every time you login, they give $25 to your account. No taxes, No Pope and his Jesuit money thieves of The Holy Sepulchre of Jerusalem, Jesuits controlling these states in America with Lieutenancy Jesuits, out of the International Charter of Judges in Roma Italy (Rome). Sounds like the mob… hell, maybe it is…. Oh boy. Your silly imaginary currency ends up on the front page of a rag. Whoop-dee-do. This may be as close to Journalism as one can now find in America, but many of us Vets are looking into making a New Broadcast center, one that discloses the Bad sectors in US Inc, US of United States Netherlands King company charter in Manhattan Island, and The United States of America 1781 Perpetual Union. As far as Money anything of a country even printed is better than that made by “MANDRAKE THE MAGICIAN”, notes made out of thin air acting as money or that as in TV series Star Trek, whereby units of credit fiction (more Pope poo), even swapping and bartering a ” PET ROCK ” is an advancement. Snide remarks you seem to infer yourself as a troll, I practice with Trolls, Commies and Fascist Common Purpose before I eat breakfast, just legally can not hunt them anymore. So Amerikan_Patriote, don’t hide your colors, which one are you, what in this U.S. muck do you represent ! ^^^ More evidence that basic training fries your brain. So this little blurb is in a shopper’s guide? The part of the paper that gets thrown out first because very few people read it? It may go to 40,000 people but I seriously doubt most of those people will read the story or even remember what it was about. You get quite excited very easily. What? No dire warnings about how bitcoin is volatile and easily manipulated, Jacks? Well that’s disappointing. But at least you managed to be dismissive without using the phrase “rants and raves” for once. How long do you think you can keep that up? I have a lot of money riding on you, you know. I read the article in our copy of the Shopper and found it interesting. I had heard of bitcoin but seeing it in our local paper made me give it a second look.